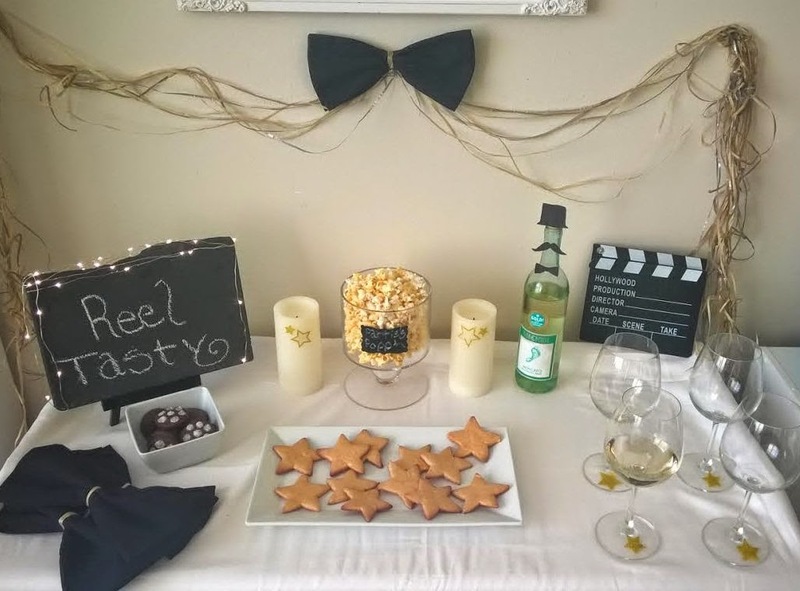 Beautiful Incentives: Oscars Night Wine & Dessert Bar Ideas- A Bow tie affair. Plus, a Giveaway! 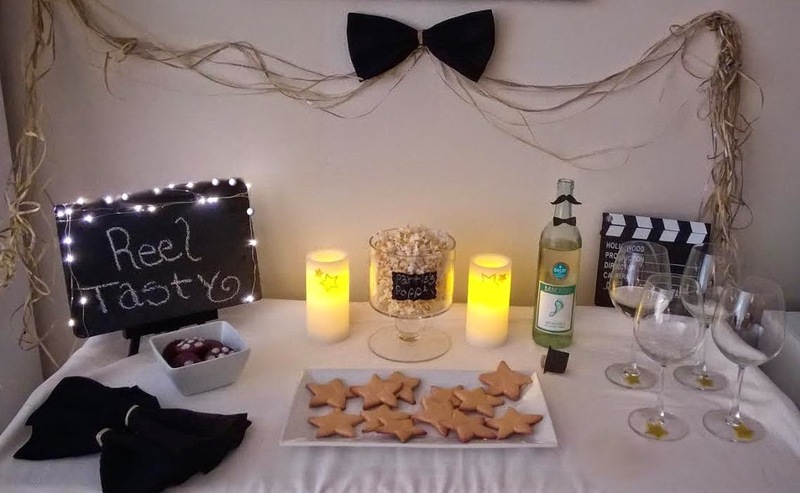 Oscars Night Wine & Dessert Bar Ideas- A Bow tie affair. Plus, a Giveaway! Special thanks goes to World Market for sponsoring this discussion and great giveaway. It's that time of year again for the Oscars! Last year I celebrated in a retro movie romance style. 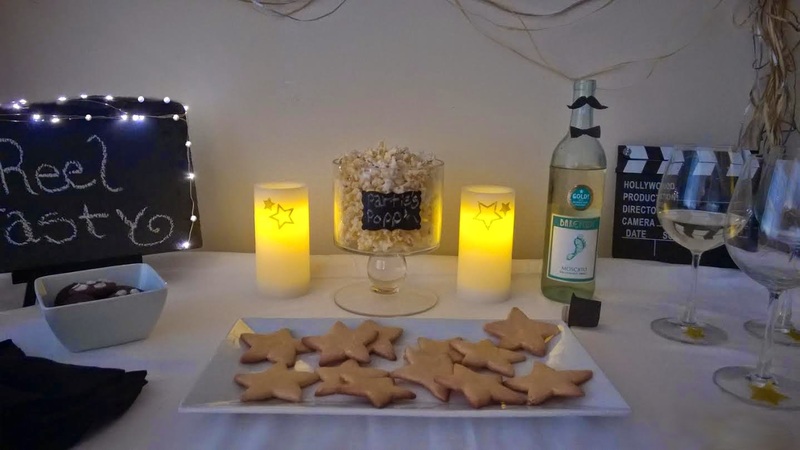 This year, I got a little fancy with a desert bar, for a small get together of 4. 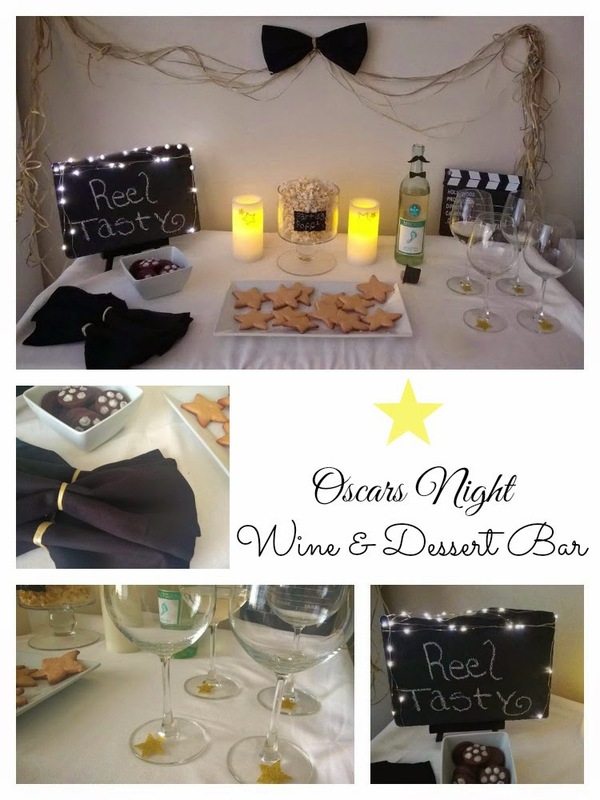 It's the perfect wine and desert bar to compliment Oscars night. The theme I went for this year was bow ties, stars and film reels. To remind you of your favorite movies and gussied up actors and directors in their finest accepting their awards. What I love about this dessert bar setup is that absolutely everything can be purchased on a budget and is perfectly reusable. All the items you see here, sans the movie clacker, I use on a regular basis or in crafting, so there's no extra costs! Stay tuned till the end of the post, where you have your chance at winning FREE movies for a year and a gift card from world market! 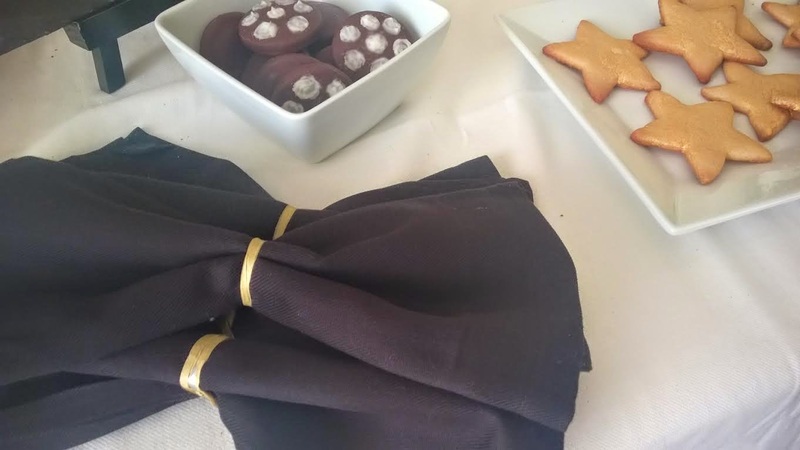 I thought what would be more perfect than to design a bow tie out of these gorgeous black cloth napkins. So that became the center piece for the backdrop streamer and the napkins were in the same shape for the guests to use. The bow tie napkin display and streamer. Just keep the napkins in their rectangular fold. Then pinch the middle together and tie the gold ribbon around it into a knot in the back. Super cute! For the streamer, I took about 10 long pieces of the gold and silver ribbon to go the length of my table spread, with enough room to be strewn up and down a few inches on the wall. The streamer was put up first with 3 tacs. One in the middle, left and right. In the middle, I tied one of the napkin bowties really tight around that tac so that it wasn't budging. 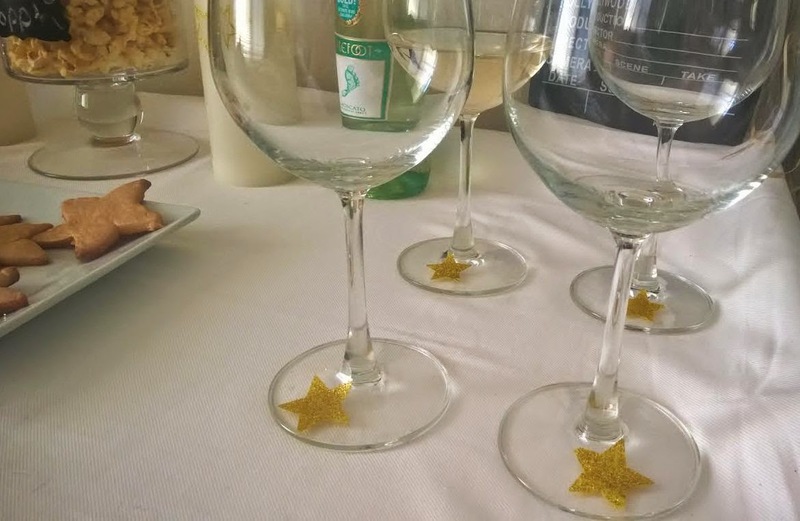 I used gold star stickers on the bases of these gorgeous wine glasses to easily dress up the beverages. The same was done for the flame less candles. These candles are so nice. They flicker like they have a real flame. What I love about them is that they time out after so long so you don't waste the battery. 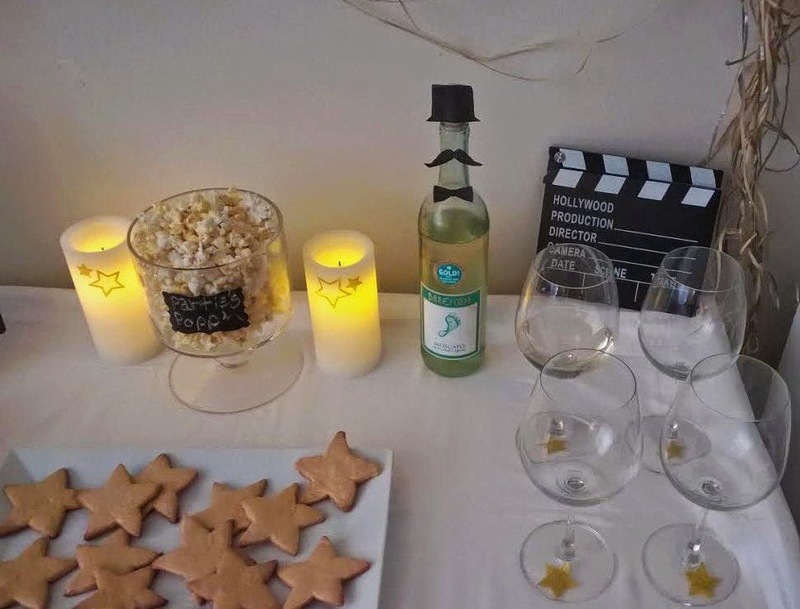 Sweet Moscato white wine is a perfect complement to deserts. Don't forget to dress him up with his top hat, mustache and bowtie. It's a bowtie occasion for everything. Even the wine. Snag the free bowtie set printable here. 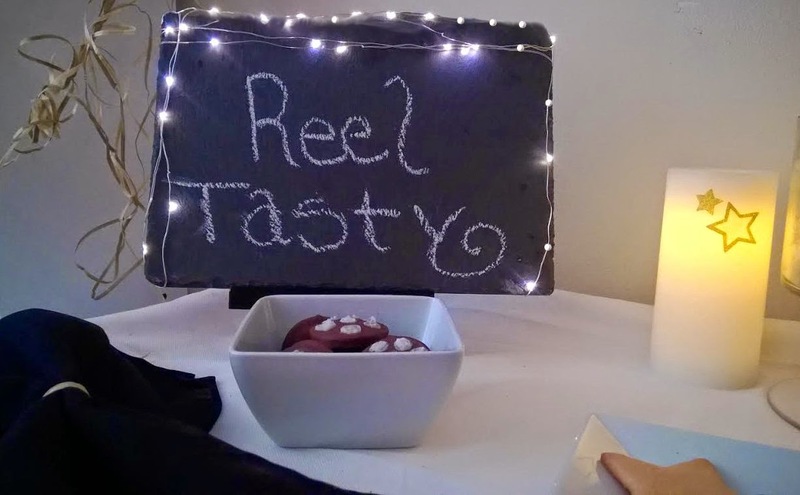 The "Reel Tasty" Sign was made with a chalk friendly cheese slate board and led lights. This is standing up with a convenient picture easel from World Market. I thought the led lights and movie clacker were a great touch, to give this desert bar a "Lights, camera, action" feel. The sugar cookies were prepared per package instructions and then cut out with a star cookie cutter from World Market. 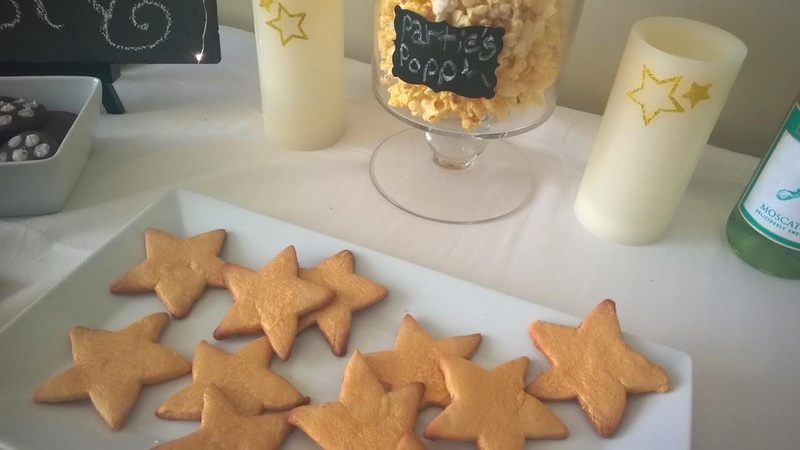 Once the cookies were cooled off on the rack, I used edible gold spray paint by Wilson to give them that shiny golden star look. So easy and on budget! I laid these out on a beautiful white serving plate. Perfect for a dozen cookies or more, stacked. The cookies I used were already made, from World Market. They are a really scrumptious thin mint chocolate chip cookies, by Arnotts . These are the perfect rounded shape to make reels with. Did I mention they are JUST like girl scout thin mint cookies? White chocolate chip melts by Wilson were used to design the holes where the film would go in the reels. I did this by melting the chips in the microwave for a few seconds and using a toothpick to draw the circles on. Then they should be set in the fridge to cool while they wait to be served. The white chocolate melt goes on great and hardens right up on contact. Make sure to use the melted chocolate right away, as it will harden within 15 min or so. These were displayed in a beautiful white square bowl. I'm such a fan of these Chalk board labels. They are so crafty and convenient and really perfect for labeling anything. Especially foods. They easily go on and peel off almost any surface. World Market has some really fun shapes and sizes to choose from. The apothecary jars like this one at World Market are so pretty and perfect for these labels. Arnotts mint slice cookies used for the reels. Gold and silver ribbon . 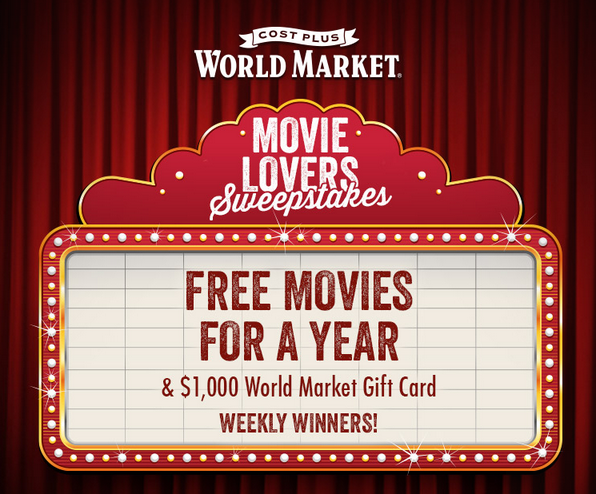 Cost Plus World Market is sponsoring a giveaway for your chance to win a $1000 Gift Card and A FREE full year of movies!